IBF welterweight champion Kell Brook (35-0, 24 KOs) did what he had to do in destroying his opponent Frankie Gavin (22-2, 13 KOs) in six rounds on Saturday night in retaining his IBF 147lb title at the O2 Arena in London, UK. Brook landed a nice right hand that hurt Gavin. 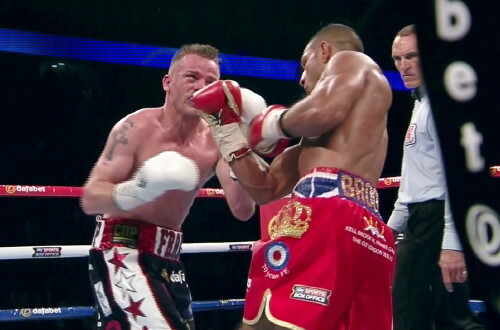 Brook then unloaded his artillery on Gavin until he slumped into the ropes. Referee Steve Gray stopped the bout at that point without a count. The fight, if you want to call it that, was stopped at 2:51 of the 6th. Gavin was too hurt to continue. The referee would have done him a huge favor if he’d stopped the bout a couple of rounds earlier because this was never a fight to begin with. Brook’s promoter Eddie Hearn mentioned afterwards that Brook will be back in the ring in August or September. He mentioned Keith Thurman and Brandon Rios’ name, but it’s likely that Hearn will continue to match Brook against guys like Gavin for a little while longer until fights against Rios, Manny Pacquiao and Amir Khan can be made in the future. Brook could be back in Sheffield for his next fight. In the co-feature bout, unbeaten heavyweight Anthony Joshua (13-0, 13 KOs) made it look easy in beating old war horse Kevin Johnson (29-7-1, 14 KOs) by a 2nd round knockout. Johnson attempted to go to the ropes to play rope-a-dope with Joshua in the 1st, but it didn’t work. Joshua unloaded everything but the kitchen sink in flurrying on Johnson until he dropped to the canvas. Johnson got up but was sent down once more as time ran out in the round. Joshua put the end to the fight in the 2nd round after hitting Johnson repeated with hard shots to the head without anything coming back. Referee Ian-John Lewis did his duty and stopped the fight at 1:22 before Joshua had a chance to finish Johnson off in the traditional manner. This was the first time Johnson has ever been knocked out in a fight. Linares took charge of the fight and hurt Mitchell in the 10th with a right to the head. A short while later, Linares dropped Mitchell in the corner with a brief salvo of punches. Mitchell got up, but the referee stopped it anyway. The fight was stopped at 2:57 of the round. In a real surprise, IBF featherweight champion Evgeny Gradovich (19-1-1, 9 KOs) was beaten by Lee Selby (21-1, 9 KOs) by an 8th round technical decision. Gradovich was cut over both eyes, and that led to the fight being halted with it then going to the cards due to one of the cuts resulting from a head-clash. Selby won by the scores of 79-73, 80-72, 79-73. Former WBO light heavyweight champion Nathan Cleverly (29-2, 15 KOs) got back to his winning ways with a 1st round knockout over 3rd tier fighter Tomas Man (13-9-1, 8 KOs). The fight was stopped 24 seconds into the 1st round. Cleverly was playing it safe by facing a weak opponent because he has a world title shot coming up against WBA champion Juergen Braehmer.